Everyday health. Rich in vitamin D. Delicious strawberry flavour. Contains 7 essential vitamins. UK's No. 1 trusted by parents kids vitamins brand? ? Based on 52 W/E Sales Data: 12.08.17. We all want our little ones to shine in life! 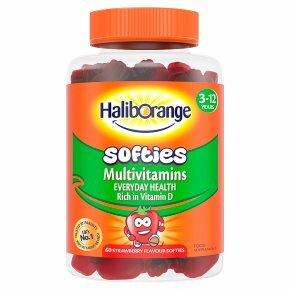 Haliborange Multivitamin Softies are a tasty way for your child to get some essential vitamins they need every day. UK Dept. of Health recommends all children from 6 months to 5 years take supplements in the form of Vitamins A, C & D. (Source: nhs.uk) Vitamin A: Helps support normal vision. Vitamin C: Helps support the immune system. Vitamin D: Essential for the normal growth and development of bones in children. Vitamin B12: Contributes to normal red blood cell formation. KEEP OUT OF REACH OF YOUNG CHILDREN.<br>CHECK SEAL IS INTACT BEFORE PURCHASE.<br>REPLACE LID SECURELY.